Our Nissan radio code service is available 24 hours a day 7 days a week. We guarantee our radio decodes work, that’s why we are the UK's No.1 radio code company and offer a 100% money back guarantee! The 'Serial number', 'Device number' and 'Date'. should display on the radios display. (Please see image for reference). Make note of all the numbers, as you will need it when ordering on the next tab. 1. How to get your Nissan Daewoo radios information on the radios display. it will show 'Radio Code:'. The 'Serial number', 'Part number' and 'Prod Date' will display on the radio. (Please see image for reference). Please make note of these numbers, as you will need them to order your radio code on the next tab. It is quite simple to remove your Nissan radio. You will need t a flat-head screwdriver for prying the panels off the dash to Access the radio. Clarion radio removal keys are ideal for freeing the head unit from the mount. How to find your Nissan radio serial on the radios label. To find your Nissan serial number, you will need to remove the radio using radio release keys. Once the radio has been removed you will need to locate the radios label, which is on the top or side of the radios casing. Why Choose us to Decode your Nissan Radio Code? OnlineRadioCodes.co.uk is the U.K's No.1 Radio Code Company. We was established off the back of many customers not being happy to pay the prices of local garages and dealerships to unlock their car radio. Once you have the serial number for your Nissan radio, enter this into our simple 3 step process to get your radio unlock code online. 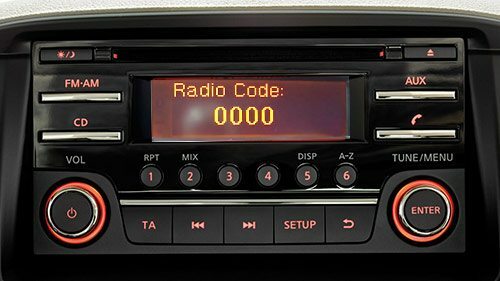 We also offer a free Nissan radio code lifetime code retrieval service, so if you ever lose your radio decode you don't need to worry! The decode we provide will always work for your radio.